Why Buy a DCI Computer 717-7917. On-Site Support on all PC brands! Support you can “Rely” on! Software, Peripherals, Internet, Data Transfer all meticulously organized to your liking, optimized and efficient. Then we backup your full setup! We include training to help you be more productive, protected and to better enjoy your computer. We provide Fast 24/7 access direct to the local technician that assembled and delivered your computer and that is familiar with your whole setup and has over 18 years full-time experience and the desire to satisfy. We assemble your computer using Top-Rated “Non-Proprietary” components. Local Fast and Full Support – Why Take Chances? Beginners - We Have Patience! Power Users - can best appreciate our reliable computers and comprehensive, but clean software setup. Wouldn't you prefer to buy your computer from local and highly experienced technicians that you can easily reach for support! Not only the person that built and delivered your computer, but that is also familiar with your entire setup! We never say you didn't buy an item from us so we cannot help you. No run-arounds. No passing the buck. Direct 1-to-1 local support from a technician that has over 18 years full time experience! When you purchase a DCI computer you are given the cell phone number of the technician you would want to reach 24/7. We do not play the “who can sell the most price attractive computer” – We sell Industry Standard (non-proprietary) computers for the office or home. DCI systems are assembled with top quality rated components. We do your full software and hardware setup - to your liking, and then back it all up. We find that our computers provide the best real value. As we also service on-site all brands of PC's we frequently come across people with new or young PC's that have become very frustrated in their dealings with their vendor’s lack of support. Although we have a great desire to help such people we are limited in what we can do; as in most cases the computer they purchased was assembled using proprietary (one source) components. It is no mystery to us that so many do not feel PC knowledgeable and do not get much enjoyment or added use out of their PC as they are provided with no instruction and receive a computer with a software setup that is comparatively very poorly setup, disorganized, lacking the needed; updates, utilities, protection, backup routines, and frequently have problems right out of the box! Naturally we can do a better job servicing a computer that is not proprietary and that we are extremely familiar with and is the reason we recommend buying your computer from us so we can do the whole job to ensure your satisfaction. We meticulously setup your computer in a very organized (non-cluttered), reliable and user-friendly manner. We do not load excess background programs that typically reduce reliability and slow down your computer. We install the latest security updates, needed utilities, other software you may own, and will transfer your data from another computer. Then we go over it with you, customize it to your particular likings, back it up and provide 2 years of fast on-site service. Since we do your full setup; rather than just copying a mass-produced basic setup, your computer gets a much more thorough burn-in and testing. To see pictures and reviews of the components we use click here. For system pricing click here. To configure your own system click here. For personal details on us click here. For an Index of this web site click here. As we never get the space or time, in other forms of advertising, to provide the full details we are taking advantage of this cyber-space to provide you with the full details below - Please forgive a little redundancy. Setup to your likings, backed up plus training. Why Buy a DCI Computer? Ø Primarily - Because you need a good computer and fast local knowledgeable and helpful computer support you can rely on to help you no matter what the problem or cause. Your tired of dealing with salesmen who's only concern or expertise seems to be sales. You'd like a clean organized user friendly computer setup that is a joy to work on, that has routines to backup your data easily, that protects you from the dangers many run into and includes training to help you be more computer savvy and productive. Ø To play it safe by buying from a local source committed to quality customer support since 1984. Direct 1 to 1, fast support from the same person you purchased the computer from and that delivered it, setup your software, peripherals and provided training. Thus you will not have the runaround or aggravation of explaining problems to multiple people who are not familiar with your specific setup. Unlike any of the big-name vendors, if you are having a problem with a new program or device you just installed we never say call them - it is not our responsibility, but we will try to give you good suggestions of how to proceed and what to try, even after your warranty has expired. We provide you with our direct cell phone number so you have direct 24/7/365 access to the tech person you would want to reach. Ø To get a quality and reliable computer. No proprietary parts are used in our computers, so neither you or us is dependant on any one manufacturer for parts or upgrades, or the availability and price charged for such parts. We do not cut corners; our computers provide plenty of expansion bays, expansion slots, disk space, and RAM. No low-end components; we use name brand components which we have researched in tech journals, actual use and over 18 years of experience. Parts like Asus motherboards, Intel brand Pentium CPUs, Plextor CD-RW drives, Hard Drives from Western Digital, Seagate and Maxtor, Microsoft optical mice, nVidia chipset video cards, Easy access medium tower cases with proper cooling, etc. Many of the details are user selectable when you choose your particular system configuration. Ø We do your full setup so we can make sure your computer is configured for maximum efficiency and working properly and it gets a much more thorough burn-in during a full setup than do other brands that simple copy a mass-produced setup. We deliver and setup your computer. We provide a comprehensive, organized and meticulously configured software setup so you can learn and do more with your computer. We install you choice of windows and apply the latest security updates and fixes. We include many of the needed utilities most people need pre-installed like, an OEM reseller bundle containing full versions of WinZip, Acrobat Reader, Thumbs Plus Image editor/organizer, Music Match Jukebox, Real Player and a current virus scanner. Plus our extensive Internet favorites list, a local web index page, a library of premium scenic wallpaper, a tutorial help file with many tips, backup routines, some added entertainment titles, screen savers, etc. We do not provide a software title unless it is really worthwhile. We do not load unneeded auto-run items that slow the systems startup, waste system resources or reduce reliability. We organize your final setup so that it is clean, neat, user-friendly and reliable. Your desktop and programs folder is kept clean of all excessive icons that clutter most new computers. We offer a great bundled price on Microsoft Word in either their home suite of office professional suite versions, your choice. We transfer any data you may have from another computer and install other software you may already own. We install your peripherals like; (printers, scanner, camera, Palm Pilot, Internet, simple network, etc) and organize them for clean easy access via the quick Launch Pad and Start menu. Then we go over it all with you and remove anything you may not want. We update the backup routines to backup your particular data and show you how to back it up. If you bought a recommended backup device (2nd Hard disk or CD-RW drive) we backup your complete software setup. Even if you did not buy a backup device and request a backup we will backup your software setup to one of our hard disk archives for safe keeping and easy restore should something go wrong. We provide a tutorial on the system covering topics like virus protection, backing up and pitfalls to be aware of, how to protect your software setup, tips to better use some of the more popular provided programs like Windows, Internet Explorer and whatever else you would like us to cover. Plus we provide a free follow-up help session at your convenience within 6 months of the system purchase to cover any questions you may have about the computer purchased from us. Prior to delivery we run a thorough burn-in process and benchmark tests to insure the computer is stable and fully optimized. Many customers find they get more use from their DCI computer than they had thought they initially would as we provide and point out several applications that they had not thought of, or were too cautious to try installing and figuring out by themselves. We have the expertise to setup a computer that is more user-friendly than can be accomplished by vendors that use mass production lines. We include unlimited phone support and 2 years of fast on-site warranty to cover equipment malfunction. Ø Lastly (or perhaps it should be firstly); you buy from DCI because you don't want to end up like one of these poor souls that bought from the volume vendors like; Dell, Gateway, Compaq, IBM, etc. Before purchasing a non-DCI computer we highly recommend you browse through some of the articles at www.ConsumerAffairs.com to see a sampling of the type of complaints against the big-name computer vendors from an unbiased sources. I realize for some this may be a sort of a chicken and egg thing, as some people may not have a computer to access the Internet. In such cases we recommend they call us as we are always happy to setup a time at your convenience to show you what we are talking about and what we offer in person. Ø Wouldn't you prefer to buy your computer from the same experienced local technician that you can easily reach for support? Not only the person that built and delivered your computer, but that is also familiar with your entire setup. We never say "well you didn't buy a particular item from us so we cannot give you any help". No run-arounds. No passing the buck. Ø If you are in the market for a quality PC please give us the opportunity to provide you with a quote. 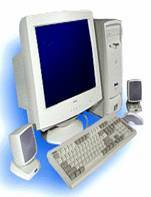 Unlike other electronics; computers are frequently having software and peripherals added and changed. They hold your data and many rely on them for business. So it is the last item you should buy from a place that cannot do the whole job, that does not provide full support, and does not offer prompt quality local onsite support. Being in the computer service business for the past 18 years, we get to service a lot of the computers locals buy and feel obligated to inform you that these so-called name brand computers leave an awful lot to be desired! It's sad to see how frustrated many of you are, and discouraging when some vent their anger at us when we are sometimes unable to provide fast or inexpensive service repairs, as our options are limited by the manufacturers selection of proprietary components used in the computer purchased. It is no wonder so many remain computer illiterate even after owning a computer for so long; as they do not like using their computer due to all the frustrations encountered and or lack of a good setup and basic training. Many blame Microsoft, but we feel the blame really belongs on the computer vendor, or purchaser for buying from a limited support vendor. We see a huge number of problems on young and often brand new computers, which we are called upon to help, as the customer is fed up trying to get warranty support from the vendor. By the time they or we get it working and configured the way they need (IF EVER) they often end up paying more than they would have to purchase a better (faster, more reliable and better configured) and fully setup computer from us. It seems that the big vendors priority is volume sales and that they cut corners to provide the all-important attractive base price. No matter how good a computer technician may be it is much more difficult (sometimes impossible) to support or troubleshoot a computer that they do not have compatible parts to swap with and test against. DCI computers are assembled using industry standard high quality name brand components. The big-name vendors usually use proprietary components, meaning many of the parts in their computers can only be had from them; thus upgrades are sometimes unavailable and service typically takes longer and is more costly, as we cannot test problems by swapping a motherboard or power supply if we do not have access to such replacement parts. We stock extra parts that fit our computers or any industry standard computer. Furthermore every non-DCI computer we service typically uses different components and thus different software drivers, while this gives us a lot more experience in working with a broad range of components it requires much more time (and thus cost) than it takes to service an item with which we are already extremely familiar. So although we do service all brands of PC's, there is only so much we can do on non-DCI brand computers. This is the reason we push our line of computers - because it assures us that we can do the whole job and not have to depend on any one manufacturer for cooperation or parts. We provide many configuration options on the computers we assemble and prefer you call us for a quote, so we can be certain the system we quote you will meet all your needs and then we will fax, E-mail or deliver you our quote. If you would like a hands-on demonstration of the computers we sell please call and we will be happy to schedule and appointment at your convenience. We offer a professional service; we all have college degrees, myself in Electrical Engineering, John a B.S. in Business and Matt was an officer in the Army for many years. No geeks, nerds or goofy teenagers they say cool a lot, we provide professionalism and concentrate on what is really cool - I computer that does what you want, that you are comfortable with and has local fast and full support. As some people want to better understand the internal make-up of their computer they express a desire to watch and or participate in the assembly and software setup process, which we are very happy to provide. We are not interested in keeping anyone in the dark and are always happy to provide detailed answers to inquiring minds. No two computers we make are identical, as we do the whole setup - they will at least vary in their software and peripheral setup. Unlike the volume vendors that produce thousands of identical computers and then leave it up to the purchaser to complete their particular setup (which makes the most sense for their type of business and also gets them off the hook for supporting many of the problem you might run into) we do your full setup and thus have a much better chance of solving whatever problem you may incur. When you are comparing prices keep in mind the added costs you will incur on their systems to finalize your setup like, buying and installing extra software and peripherals you may require, configuring your Internet access, printers, installing the available Windows updates, finding and installing needed utility programs. And after doing all that is the computer still reliable, efficient and organized? If not add the cost of downtime while repairs are arranged and performed and once done you often have to redo your custom setup again and again till it all works right. Plus we provide many extras which help most users (power user included) get more use and enjoyment from their computer. All of which is worth more than most realize, and especially unrealized until they get to use a DCI computer first hand for a while. We wish to inform those shopping for the absolute lowest initial cost system that we do not claim; nor try to sell low-end or misleadingly base priced computers. It simply costs more to assemble a quality non-proprietary computer, as we buy each part separately and do not cut corners. We feel our prices are competitive when you take into account that we are not selling a mass produced computer with limited support, but are providing a completely setup package, custom built and fully configured, (with all your software, peripherals, data, etc) fully optimized and organized system with maximum local support. We are not a high volume out-of-town distributor, but rather a local low volume - high support dealer with over 18 years of full time experience. We believe we offer the best value! Measured by how usable your computer is and how happy you are with it - NOT by how little you pay initially! The saying you get what you pay for is particularly true when it comes to computers assuming that the price paid includes competent, committed local support. We do provide a discount on multiple system purchases. We are so confident that you will prefer our computers and support that we are offering you a no-risk opportunity! We will deliver your dream computer, set it up and go over it with you, and if within 30 days you do not wish to keep it we will pick it up, refund your money, and thank you for the opportunity of showing you our computer. If you decide to keep it we further customize it to your liking, provide additional training and 2 years of fast on-site service! Why take chances? Deal Direct - 1 on 1 - Locally! If in doubt and able then buy several of you choice brand computers, each with an unconditional money back guarantee and return all except the one you most like; as we doubt anyone would be returning the DCI computer. During our entire history we have been asked for only 2 refunds. The refunds were given promptly and in full. One because he decided he needed to spend the money on a truck instead of a computer and the other we never got a straight answer as to why he was returning it. During this same period if we had any dissatisfied customers they did not let us know of their dissatisfaction so we could address the problem. Do you think we would chance any complaints filed against us with the BBB or on the Web sites we have links to on this page? We feel having any dissatisfied customers would be more costly than the costs involved to keep them satisfied. Although we have never had a dissatisfied customer this does not mean we never loose a client. Some companies have out grown us having needed to develop their own in-house IT staff to support their large wide area corporate networks. Some others decide to go it alone once they had acquired more PC literacy, hopefully enhanced as the result of having owned one of our computers. Still we feel in this type of situation they would be better off sticking with us rather than depending on the support of others as we too continue to learn and have more to offer if given the chance. DCI specializes in the local sale of quality desktop PCs and networks for the discerning business or home consumer that demands top quality. We have been assembling and supporting Industry Standard PCs since 1984. The PC industry did not exist until August 1981 (3 years earlier), and of the 3 companies that have been selling PC's longer you will not find a reachable technician that has as many years experience as you can reach here at DCI. I personally have been an avid computer enthusiast since 1971 and started assembling my own PC compatible computers in 1983. Matt whom works with us has been assembling computers longer than I. Thus we feel we have the expertise to handle most PC support cases faster and better than our competitors. We operated from a store at the foot of Carrollton for 4 years then bought and moved into a building on Magazine street where we operated for 11.5 years (until November 1999). As our main technicians were mostly out in the field providing service it became apparent that maintaining the added cost of a storefront had become impractical. We now perform the bulk of our sales and service at the customer's location. We maintain two shops (one in uptown New Orleans and one on the North shore) where we assemble new computers and perform service on computers that require in-shop care. Although these shops are not in commercial zones and thus not open to walk in traffic, we still maintain the same level of inventory as we did when we had a walk in store, so we can quickly service any industry standard PC. We find this new structure to be beneficial to all as; customers prefer on-site service which we do at the same rate it used to cost them to come to us since we do not charge for travel time in our service areas; and you now have better direct access to us via our cell phones, so you can always reach the technician of your choice directly. Quality not Quantity is our objective. Our motto is simple "Keep the customer happy" otherwise we know we will loose out in the long run on future sales and possible referrals. Our method to achieve this goal is by providing reliable computers, exemplary software setups, extra training and fast support. We provide training and support on any brand PC. We push our own line of computers which we assemble as we can naturally do better support on systems we are extremely familiar with and for which we stock parts. Our computers are assembled using high quality industry standard components (meaning no parts are proprietary to one source; thus better availability and pricing on upgrades). We are not interested in saving a few bucks on each part to lower prices, or to be more competitive; as we believe cutting quality ends up costing more than doing it right in the first place. We guarantee that all our computers are assembled from industry standard size components as we do not manufacture any components and do not want to be dependant on any one source for parts. Our computers have plenty of room for future expansion and there are many competitive suppliers for replacement or upgrade components. Unlike most of our competitors we do not lock you into us for service on any components and thus our computers can be easily upgraded and serviced throughout its life by any knowledgeable computer technician. Thus you are less likely to outgrow a DCI computer as quickly. Our average repair turn around time is under 8 hours! We have never lost any customers data, as we take precautions to backup the customer’s hard disk before making any risky changes. Sure some customers have had a hard disk die on them and they have lost anything they did not have backed up. DCI has received a Better Business Bureau's Award of Excellence. We have been in continuous operation since August 1984 and in that time we have never had anyone file a complaint against us. Accessibility to reach us is a key ingredient in maintaining satisfied customers so our main business line is always forward to a cell phone, thus we are extremely reachable (24/7/365). The drawbacks to having all calls go to our cell phones is that cell lines sometimes get overloaded and you could get our answering machine even though we are available, so please if you get an answering device leave you name and number and we will get right back to you. In some rare cases you can hear the line ringing, but get no answer nor answer machine and it does not ring at our end in which case PLEASE try us back in a few minutes. We apologize for any inconvenience this may cause and we are not at all happy about this situation, but it is not frequent and we know of no better way to provide direct access to the technician you would want to reach. Also as the calls are forwarded please let it ring longer than you might be accustomed. One type of computer that needs to be super-reliable is a company's file server. There are several types of servers; Print Servers, Web Servers, Application Servers, Remote Access Communication Servers, etc. In this case we are talking about a file server, which holds and shares the company's main data files. If this computer goes down or needs to be restarted a large portion of a company's workflow can be disrupted. Having 18 years of experience setting up such servers we feel we have gathered key knowledge required to properly setup your company with this mission critical type of computer. Our systems are much more virus resistant than others as we setup the following precautions; Configure the system to not boot to a diskette so you cannot get boot-sector viruses, install the latest Windows security updates and show you how to keep them updated, install software that intercepts suspicious possible virus code it detects running and notifies you so you can abort it before it causes any damage, educate the buyer on how to avoid viruses, provide routines to check for and remove viruses. We and many others feel virus protection programs that are set to be always running are an example of a cure that is often worse than the disease. It is not really a cure at all, rather they are providing the user a false sense of security. Unless requested we do not install the type of virus programs that need to be always running as they slow down your computer by about 10%, and frequently interfere with legitimate programs by causing system lock-ups. They give the user a false sense of security because most virus damage comes from new viruses often less than 48 hours old and as very few people keep their virus definitions databases up-to-date on a daily basis they have no protection from the main threat. However the user thinks they are protected and thus will often be less cautious as a result. Here is a link to an article that backs up this claim. We provide you with better protection via a program that does not need to be always running or kept up-to-date to protect you from common viruses. We also provide you with a top-notch virus-checking program that you can run at will and with a link to the web site where you can download updates. Also we provide you with a program you can run on occasion which checks for backdoor type programs running on your computer and with links to web sites that will check your systems vulnerability to unauthorized access. Along with our training, provided on delivery, you will be far better protected than on computers from other vendors; plus our computer will be faster and more reliable since you are not running the additional background programs. This can save you and your friends a lot of money, aggravation and time since viruses can destroy your data and software setup as well as friends that you can unknowingly end-up emailing the virus. This is just one example of how our provided software setup protects you, improves reliability, improves performance and can save you time and money. We would like to go into a little detail about common corners cut by the big-name brand vendors in order for them to achieve their attractive base prices. Common corners we see cut include; support, performance, RAM memory and disk storage space, lack of expansion slots and bays, integrated low performance video cards that also steal some of the system's main working RAM memory, integrated low performance sound cards, disorganized and faulty software setups, lack of a backup device or backup routines, lack of qualified presales research to verify that what you are buying is what you need, any of which frequently end up costing the buyer a great deal more over time than that quoted base price. We do not play this attractive initial price game and do not cut corners. We are not pursing volume, rather customer satisfaction and referrals. Unfortunately the computer literate or power users are often harder for us to sell to, not because they know more, but because they feel they are paying more for our bundled training and setup which they feel they do not need. We throw in so much that few need everything we bundle, but this should not justify buying an inferior computer with inferior support that might leave them stranded. Besides we do not charge extra for our bundled software setup, training or delivery. We include these extras because we find that all users benefit from it and we have never met a power user with whom we could not provide several worthwhile tips. Our initial training session is optional and is geared to fit the users level of expertise. In order to provide the quality of computer, computer service and fast local support our customers want, we are not in the large volume mass production business; thus we have to charge more per computer than places that are in that type of business. We try to make up for the added cost by including extra value such as training and a full setup, but we are not charging extra for the added labor. We love to sell to the more computer literate because; they can best appreciate our systems, they come up with the less common support questions and they are the ones others ask where to buy a computer from. Still even though such a person is capable of setting up their own applications consider the time involved to do so and if the end results were to match our setup we know it would take over a hundred hours. No we do not spend over a hundred hours on each setup as we start out with a base setup that already has over a hundred hours of meticulous configuring and testing. We encourage all users to be proficient in the ability of configuring a software setup as that way they know more about their computer and are generally happier with using a computer. If you are a power user and feel you can do better for less then we challenge you to buy our system and give us a chance, you have nothing to loose because if we do not prove our worth within 30 days we will refund all your money! Just let us know in advance please. Some potential customers after getting a quote from us reply that they can get a computer for about half what we quote. We are sure they can get a car for half of what they paid for their car or a house for half of what they paid for it. It seems some think the saying "You get what you pay for" does not apply to computers; whereas we believe (unlike some electronic appliances) that it especially applies to computers (assuming the extra paid provides added benefits); as a computer's configuration is most likely to require changes and updates over its useful life - added bona fide support can be particularly useful. We have been discussing the reason why we feel you should consider buying a computer from DCI. Now let's talk a little about the main reasons we are given that people did not buy from us. The main reason is that they do not know of our existence or the details of what we offer, which we are trying to remedy by increased marketing. ¯ Secondly would be price. We can certainly understand consumer's need to be price conscious as we are all trying to make a living, support our dependants and retire someday. However, as we have detailed above in numerous places, that initial base price can be very misleading and the less expensive computers often end up being the most costly. We feel if they better understood the many benefits we provide we would not lose as many potential customers. Unfortunately these benefits often cannot be realized without a good deal of PC education and/or until they have used both a DCI computer and another brand for at least awhile so they can appreciate the differences. ¯ Thirdly would be skepticism; people have been promised the world so often by salespeople that they take everything we say with a grain of salt. They frequently do not believe the big-name companies will leave them lacking in support or that they will benefit as much as we claim from our computers superior; expandability, software setup, services and training. ¯ Finally comes what we call the brand name recognition syndrome. Many want the security of dealing with a large established national company as they feel that should they have problems then they have a better chance of obtaining satisfaction from a company they feel has a better chance of being around in the future. We find brand name security to be a false security blanket as what does it matter if the company should be around forever if they do not provide decent customer support to begin with. These companies typically have no real local presence assuring you delays in service (The only one that does have a local presence on Veterans ironically provides the worse support of them all). All these companies computers are typically assembled using proprietary parts; thus greatly limiting your service options. They do not do the whole job and thus do not include full support. We feel just the opposite is true; by dealing with a small local committed and established company like DCI while you may not feel as secure initially, once you realize you have better support and have purchased a computer that does not use proprietary parts you will hopefully start feeling more secure realizing that you are not locked in to any one particular company for support. Another common related fear in dealing with a small company is the fear that they may not be around throughout the warranty. Even though DCI has been selling PC's since 1984, and we can think of only 3 other companies that have been around as long, but none locally, we can understand this concern. Even if we went out of business, we are still legally obligated to meet our warranty commitments. Only personal bankruptcy might suffice and as I (David Charbonnet) and my partner John Arbour both fully own our houses and some rental property and are fully insured with savings in the bank and the market, the little amount of overhead this operation entails is unlikely to ever bankrupt us much less the both of us. We have lived in the New Orleans area our entire lives and are very unlikely to both leave at this point. Besides if we were trying to run a scam we would be offering lifetime warranties. But lets play the worse case scenario that we both died during your warranty period and your computer developed a serious problem. The bulk of your system’s cost was the initial setup and cost of the components that make up the computer. All external peripherals like; printers, scanners etc are covered under the specific manufacturer's warranty to begin with. The monitor and hard disk besides being covered by us are also covered for at least two years by the manufacturer. Most of the other items cost so little they are not worth worrying about. The only components that cost anything worth mentioning and that you would have difficulty in getting any warranty coverage on directly are the CPU, Motherboard, RAM and Video card. The only way all 4 could go out is by a surge, which would and should be covered including labor by your personal home insurance coverage. These four items combined currently sell for under $500 plus labor. So a reasonably worse case scenario would be that you had both the motherboard and CPU die during the remainder of your warranty (which is very rare as in 18 years I cannot recall a CPU ever dying). Since we use only Industry standard components that are widely available from many various manufacturers at competitive prices you would have no trouble finding a local technician that can get or probably stocks replacements. These two items can typically be had for under $300 plus labor, usually less as time goes on. Should they fail again they are under warranty as these are now new parts from another source. Most people are more concerned about their software setup and data which no company warranties to begin with. We at least warranty the software setup till you get to check it out and make changes to it. We encourage you to buy a backup device and if you do we provide routines so you can easily back it up and if you did now get a backup device we will make a backup of your initial setup if requested. Anyway your reasonable worse case window of vulnerability is $300 plus labor, should both John and myself die before your warranty does. If you take the time to read some of the complains at ConsumerAffairs.com and other sites we have posted links to below you would see the name brand vendors often leave their customers in worse predicaments during their warranty period and much worse once your warranty expires; as you own a proprietary computer (proprietary parts typically include the motherboard, case, power supply, video and sound cards) and thus are at their mercy for parts, the availability of those parts, the cost they dictate for those parts, service costs, and turnaround times to replace the parts. Also you typically have to pay shipping even when under warranty and wait much longer for warranty and non-warranty service. As we service all brand PC's we have a lot of experience in dealing with many of the popular computer vendor's support staff and would like to relate some details on just a few of our recent experiences in dealing with them. Customer bought a Dell notebook and as we do not sell notebooks (or any computer we cannot fully service) he naturally opted to go with Dell. They sent him a notebook with Windows 2000 installed rather than Windows 98SE as he would have preferred and uses on his other computers. A few of his programs are not compatible with Windows 2000, but he decided to live with it rather than go through the hassle of returning it and taking chances on what he might end up with as a replacement. We certainly always inquire as to what version of Windows a customer wants. Anyway the main problem was that the included CD-RW drive gave errors whenever he tried to make music CD's which I confirmed. No matter how good we might be as technicians, after checking the obvious things we have to call the vendor in such a case; it being a brand new computer under their warranty. A call to a Dell technician left me holding for at least 30 minutes and when I finally got a technician on the line he apologized for the problem and explained that although this was a brand new computer and came bundled with the CD-RW drive it was not their responsibility to provide support on it and that I needed to contact Sony (the manufacturer of that component) for support! He did not offer Sony's phone number so I requested it and was given a number at Sony, but no one at that number had an idea of what I was talking about. I ended up having to find a solution myself through a lengthy searching for an answer on the Internet and updating the CD-RW drive's firmware. So it ended up costing the customer a good bit to fix this brand new Dell computer which Dell would not support from day one. This one continues 9 Months later the customer installed an off brand mouse and the notebook would not boot anymore. It just displayed a blue screen with stop message. Would not boot to safe mode either, nor would any standard Windows 2000 repair method (Boot to CD try all repairs and try to boot to last know good configuration) resolve the problem. Research problem in the Internet, at Microsoft's support site, called tech support of company that distributes the mouse, all to no avail. Call Dell and hold for support for 20 minutes, talk with randomly selected support person whom concurs that such an error (0xa having to do with ntoskrnl.exe) if not fixable via a standard repair method would require wiping the disk and resetting up Windows 2000 and all his applications, restoring his data if he has a backup, reset up Internet access etc, from scratch. In this case he had a lot of applications and devices installed so I knew it would be a full day or more of labor. So I tried other methods; to be brief what finally got it going was that I reinstalled Windows 2000 into a different location on his drive and gained access to the system and thus was able to backup all files via his network card to another computer. Reinstalled the bad mouse software to confirm it did cause the problem which it did. So now I tried repairing this test minimum setup using last known good configuration which worked on the test setup but did not on the other, after manually copying certain system files I was able to do a boot to last know good configuration on his main full setup! I removed the test setup, tested his setup and programs and did some standard system cleanup, defragmenting and more testing. The customer had his computer back with all his programs and data back in 3 days (we typically get it done in 1 day, but this one took some thought). The point is that although Dell was not in any fault in this case and provided a reasonable and expected solution, if we had followed that advice the customer would have lost his data and spent a lot more money to get the computer fully reset up. The real point is that out of state phone support is no match for local hands on knowledgeable and determined support. Thus the initial purchase price of a system is often not the long term low cost winner. A dentist customer of ours bought a Dell to replace an aging computer and requested our assistance to transfer his software and data. I reinstalled his programs and transferred his data, but when it came to moving his existing tape backup device so he could continue backing up his data as he was use to doing on the old computer I found there was no bay in which to install the unit. As this Dell system has only 1.5 accessibly drive bays (1 taken by a CD ROM drive and the other too small to fit a standard 5.25" drive) his only option would be to buy a new external USB tape drive (as he wanted to do full backups that would not fit other media) which would have cost him over $600 with new tapes, he decided to chance it and do without full backups and backup just his main data to multiple diskettes. A decent Industry Standard size case would have cost Dell or him maybe an extra $20. If Dell bothered to asked presales questions to improve the chances of better serving the customer this might have been avoided. This same system also uses a proprietary motherboard, integrated video and sound cards, has no bay for ever adding a second hard disk, no AGP slot for upgrading Video card or replacing the video should it go bad. While these deficiencies would be a problem for anyone that would need to run higher-end software it probably will not be a problem for this dentist’s needs. However if any of these proprietary components should fail he will be up a creek. In another instance I was asked to add a network card to a Dell computer to expand a customer's network. I was having difficulty getting it to work, although the same card setup and worked fine in other brand computers. So after trying everything I could think to try and after checking all network settings I eventually decided to call their technical support number to inquire if they had any information about compatibility issues with this model network card. They admitted that they use and sell the same model network card, but would not provide any help or insight since this card was not purchased from them. While they may be justified in this attitude do you really want to buy a computer from a source that is so close-minded when it comes to customer service? Ø Gateway: Too many bad dealing with them to mention but here are just a few. A business customer in Metairie bought 4 Gateways at about $2200 each (so not their low-end/value line). Could have bought from us, but he was into recognized name brands, regardless we always do our best to help the customer). They hired us to setup a simple network and shared Internet access. Within the first month two of the computers were freezing up regularly. Calls to Gateway's support were very time consuming and eventually yielded the response that they would not consider servicing any computer until the customer first erased the contents of the hard disk and restored the original setup from the CD they provided. As this customer is not computer literate they paid us to perform these time consuming operations. So we backed up their data, restored the original setup and the systems were still locking up, one during the restore process. Eventually Gateway allowed them to bring it (no they would not send out a service man even though they had promised on-site service for the 1st year) into the local Gateway Country store to be serviced. Eventually about 2 weeks later the customer is called to pick it up and had us return to test it out and re-setup their network, peripherals, shared internet access, etc at more cost to them. It was not long before they once again started experiencing frequent system lock-ups and to keep this short we will just mention that they have been through several more complete software reset ups from the original CDs as demanded by Gateway and several trips to the Gateway Country store. The customer has incurred a great deal of service costs, business downtime and aggravation. One of their computers came back from Gateway with a different customer's software setup plus a particularly nasty virus that has propagated thru their network. Last I have heard they were still having major problems and have started legal proceedings against Gateway. I know they have spent a great deal more than they would have spent if they had bought their computers from us and they have had to deal with a great deal of aggravation. They were computer novices and will likely never want to deal with computers any more than necessary after these experiences. No matter how badly we want to help them our hands are tied. So don't think buying a computer from a big-name vendor will insure any kind of satisfaction or that should they fail to support it you can hire a 3rd party technician to fix you up for a reasonable price as these type of computers use proprietary parts. We have had many bad experiences trying to help customers that bought from Gateway and cannot recall ever having gotten any useful support from them, just combative attitude and threats of voided warranties. They have always denied onsite service, and sometimes even denied to provide phone support! When equipment was brought to their service center they have repeatedly botched the job and taken a long time to do that. Ø Compaq (like Gateway) we have had many bad experiences and no good experiences. Typically their computers are preloaded with so much baloney it is a wonder they work at all. Several customers we have dealt with suffer from extremely poor performance and frequent lockups, some on brand new computers. Sometimes the customer blames Microsoft; However we know it is not Microsoft's fault that these computers are so weirdly setup. Right out of the box many new Compaq systems I have helped setup are overloaded with goofy programs that get run at startup. Programs that keep running in the system tray and can interfere with the main programs the customer needs to run. They replace Windows default shell with their own front-end program and add numerous background applications to do various and unnecessary tasks. These computers take much longer to start than they would otherwise. Their software setup, like many others, are very disorganized and very non-user friendly. They are often sold with an inadequate amount of RAM and drive space (probably so they can advertise that all important attractive base price). They cause the user a lot of lockups, lost work and aggravation. However like many users they often try to live with the problems since the alternative of trying to get support on the telephone and then bringing it in for service, doing without it while being serviced, wondering if they will get it back in any better condition and possible without their programs and data, is not an appealing option to them. We find many people end-up just living with the problems and hating computers; whereas those that buy from DCI are quick to ask for help because they know they will not get the run-around and that we will properly fix the problem. Ø IBM: Recently I was called to help a new customer (local lawyer located in the Whitney Bank building) setup his new $2200 IBM tower system and printer. Upon opening his package I found the PC's front face place has come loose and his mouse was damaged and un-operable both probably damaged during shipping. He wanted to continue on with setting it up and called IBM to inquire about a replacement mouse. After about 40 minutes I had his system all setup and had provided him with a loaner mouse and was ready to begin his tutorial, but he was still busy being shuffled around the phone system at IBM and becoming very obviously irate. First IBM wanted him to send the whole computer back to replace just the mouse. Finally 20 minutes later while I sit and wait on his payroll, costing him more money than the mouse costs, he got someone to offer to send out a replacement mouse. During my setup and testing of his computer I noticed the computer would not shut down properly on several occasions. He had bought separately a copy of WordPerfect, as the system did not include it or any popular word processor. During the installation of WordPerfect the system gave an application error, but I did get it installed on the next attempt. I know shutdown problems are typically caused by a conflict with a device driver or one of the excess always running programs IBM saw fit to load. I offered to try to resolve it, but he is not looking to spend the money or take the time that might be entailed, nor does he want to talk with IBM support anymore today and will probably just live with this problem. So after buying the computer and a retail (more expensive) version of WordPerfect since it was not bundled with the computer and paying me to get him started he has ended up paying more than would have to buy a more powerful, industry standard, more reliable computer locally from us had he known about us. I doubt he would have gotten a quote from us anyway as he appears to have had a case of the IBM name brand fever. The lesson I would hope he might learn is to next time shop around and find a computer from a local source that provides quality support. A month later I stopped by to pickup my loaner mouse and find he had not used the new computer at all as his data is all on his old 1984 IBM PC. It would be difficult to move his data since his old computer only has a 5.25" 360K floppy drive. With a DCI system purchase we would have provided him free data transfer and he would be using his new computer. I offered to move his data for 2.5 hours of labor as I would have to move it (on 360K disks to another computer to put on a CD disk) which he is considering; in the mean time he is getting zero use from his IBM system purchase. Ø eMachines we have no experience in dealing with their support staff. Their systems often come with only 15 days of phone support, unless you buy the extended support plan. At least on the ones I helped configure I noted that their software setup while far from comprehensive is vanilla and did not include any of the troublesome add-on always-running background programs. However their computers typically lack much room for expansion and should they need service it would be a lengthy process. Ø Other common problems we repeatedly read about. Bought a new (in this case Dell Dimension system) and find out the video and sound cards are built-in and as there is no AGP slot I am unable to upgrade to a better video card it is to slow to play the games I wanted the computer for, and there is no option on the Motherboard to install a better Video Card, but now it has been 30+ days and cannot get a refund. I find I would have to start over with a new computer or forgo my desire to run some of the applications I had planned on using. Both Dell and Gateway promise onsite for the 1st year, but I have never seen them do it. Although I have heard rumors that Dell sometimes does, but rarely anything close to next day as promised. These stories are the truth and we welcome any of these companies to challenge us as we can use the publicity. We do not claim that this is always the case, but it has always been the case in our experiences. According to some of the many letters I have read online from their customers it seems their service can be very erratic approaching decent (for an out of town source) if you happen to belong to a larger company that might afford them high volume future business. Sometimes initial computer malfunctions are not the vendor's fault as computers sometimes get damaged in shipping. In which case the buyer frequently has to pursue a lengthy process of getting it fixed. As we do a full setup it takes a great deal more time to configure your systems software setup and after putting that amount of time in configuring and testing it we would not chance relying on someone else to deliver it. As we only deal locally this is not a problem anyway. We could not recommend any recognized brand name computer, but so you can tell which we prefer, if forced to deal with them, on a scale of 0-10 we have to give Gateway by far the worse rating of 0, Compaq a close second worse of a 1, HP and E-Machines a 5, and Dell a 6. Those that would rate them higher perhaps do so because they have never seen a 10. Should you ever have to deal with any company's support staff try your best to remain pleasant as anger has a way of propagating and becoming self-defeating. Write down the name of everyone you talk to and the date. If you are not getting satisfaction from the person you reached ask for another or call back to get another. If still getting no satisfaction ask for the support supervisor or manager. If still getting nowhere E-mail the head of customer support a letter detailing your problems and attempts to acquire support and that you are considering sending a copy of the same to ConsumerAffairs.com, PC Magazine and their local attorney general. If we as highly skilled computer technicians have great difficulty in getting decent warranty support from these vendors what are the chances that someone less computer literate will get better results? bought from the popular name-brand computer vendors. Any profanity found under these links is not our doing. law firm will be making a killing in a class action suit against them. personal bad experiences, no good experiences at all. less used computer brands and keeping so many links updated is difficult. please bear with us as we will be checking and updating them on occasion. ECS, Azza, Transcend, TMC, Protech, Etc. Note: None of the big-name PC manufacturers use any of the above industry standard (non proprietary - easy to get replacement or upgraded parts from many sources at competitive pricing) motherboards, yet these manufacturers manage to sell a lot of boards. So there must be a lot of people out there that think like we do; that when it comes to buying desktop computers, getting a system assembled from all industry standard components is of utmost importance, so as not to be at the mercy of any one company for parts or service. Sometimes people see these lists and hear us rant on about buying industry standard computers and try to go it alone and assemble their computer piece-meal themselves and have great difficulties and may think we had given them bad advice. I would not even try building a singleton (without an inventory of similar parts to test against) system by myself. Believe me we are worth what we charge and you do not want to go it alone. We have provided these links to clarify our philosophy not to suggest anyone should go it alone, but if you wish to do it yourself in order to be more self sufficient and knowledgeable then just ask and we will provide you at no additional charge the opportunity to assist in your computers assembly and software setup configuration. the components we use to assemble a computer. Web links change frequently so if any of the above links we have provided are now a dead end please bear with us as we will be checking and updating them on occasion and as we include so many links it is expected that some will disappear, besides most users can search the Internet without our assistance and if you can’t then it is time to practice or just call us and we will gladly try to help you find what you are looking for at no charge. As we are often asked to explain in a limited time some of the main points of how our computers differ from the name brands and at the risk of being repetitive we will summarize some of the above in one paragraph. Their computers are usually proprietary and thus full support can only by obtained by that one manufacturer, but they are not interested in supporting your entire setup; thus you cannot obtain full support from one source. Availability of the proprietary parts (motherboard, power supply and often video and sound cards from that manufacturer can be non-existent or if available they typically cost much more (since you have only one source for the part), and if available they take longer to get. Expandability of those computers is often much more limited. The support they provide can vary greatly sometimes providing no support even while under warranty. At best they provide very limited support covering only the items you bought from them; whereas we support your entire setup, which we are familiar with since we set it all up. They are usually not local and the one big-name that is, just as soon not be. Their software setups typically leave a great deal to be desired as they are disorganized, and they often load excess running applications that degrade performance and reliability. Their computers are not as thoroughly tested as ours as each of our systems is individually setup by a professional and more fully used while we install your applications, peripherals and provide your training. They provide neither the latest Windows updates nor the needed utility programs, leaving it up to you to learn you need them and how to obtain and install them. You learn less and can do less on their computers, as they do not provide adequate training; neither added programs nor a software setup that helps you learn and be more productive. They do not get sufficient presale details to help insure that the computer you are buying will meet your needs, and many find out after the purchase that the version of Windows is not as needed or the peripherals they intend to use will not function or fit in that system. Their systems are more prone to viruses, which can cause you to loose data or your entire setup. Some vendors insist they will not provide warranty support unless you wipe out your software setup with data and reinstall the original setup as you received it, so they can test it over the phone with their original setup. Some of them mislead you into thinking on-site service will be provided. They are typically much harder to get in touch with than us or to get satisfaction from. They often will give you the run-around and no solutions or the wrong solutions. Even when you get to talk to one of their technicians they will not have near the personal experience (18+ years) we provide. Should you need to call them back about a problem it is very unlikely you would get to talk to the same person twice. When their computer is out of warranty should you have a problem or want to upgrade any of the proprietary parts you typically find it will by cheaper to buy a whole new computer. If you end up as one of their customers that does not get decent support you can become very frustrated. Your chances of longer down time while service work is performed is typically much longer (than our average of 8 hours) and if you depend upon your computer for business this can end up costing you lost business and money. They rarely provide any backup device much less routines to do your backups or train you how to do them. If you are a beginner you will have a more difficult time in getting support by phone, as it will be harder for you to relate with them or follow the instructions you may be given. Due to their lack of bundled decent software setup and training a beginner has a good chance of ending up disillusioned and not liking their computer or computers in general. They frequently sell you an underpowered computer in order to advertise an attractive price and make the sale. They can live with dissatisfied customers as shown at some of the links to customers complaints we provided for instance at ConsumerAffairs.com whereas we have no dissatisfied customers. Their systems are sometimes damaged during shipping. Their systems often have some type of problem upon delivery like not shutting down properly. As we deliver our system we make sure they are working and doing everything you requested. Many are less likely to repair minor, but irritating problems on such computers as they find it easier to live with the problem than dealing with their technical support staff or risk sending it off for repairs fearing the time they will be without the computer or that it may come back in worse shape, or without their data; plus you get to pay the freight. In the minimalist of words we would say the difference is like the difference between night and day or between success and failure, but few seem to find that a sufficient explanation. The only advantage we can see that they offer is that you save some initial bucks. We would like to clarify some points in order to reduce possible misunderstandings about our claims. We are not jealous of the big-name vendors for we could not begin to supply the world's computer needs. We just find that in their attempts to supply volume and compete in a very price competitive market they often sacrifice; quality customer support, expandability, reliability, performance, and leave many consumers in a lurch and disillusioned when it comes to computers. I personally like computers, but if I had to buy from any of these common sources I think I would go without. Sure some get a non-DCI computer and never have problems that they cannot resolve themselves. Or have problems and do manage to get good support. Even our computers can give problems and we certainly do not mean to suggest that our computers never have any problems. In this business problems are to be expected. It is how we deal with the problems that make the difference. We minimize problems by using quality and researched parts and by having the experience to fix many diverse problems. From experience we have gained the know-how to find answers to new problems. All of which are worthless without a big desire and commitment to maintain customer satisfaction and fix problems promptly. Still no matter how committed or qualified one is to providing quality support, computers generally have a shorter usable lifespan than other electronic devices and because of this some owners of DCI computers hold it against us that they can no longer run current software on a 4+ year old computer as they could when it was new. The computer itself does not die and we have computers out there that are over 12 years old still doing what the customer originally wanted. But these are special cases where the customer does not desire to install newer and current software. Most people need to install software updates or want to buy new current software applications. Typically new programs are written to take advantage of current computer's hardware and performance. Thus after about 4 years it becomes more cost effective to replace a computer than to spend money trying to upgrade all of the more expensive components. Perhaps this progression will slow and your computer may provide you longer service, but we mention this fact to avoid misunderstandings. Some use this fact of a short life span to justify the purchase of low-cost so-called disposable computers, but what good is a computer that has hang-ups and causes lots of problems and frustration. Also we want you to understand that although we use all standard size parts (to maximize choice and availability of parts for repairs and some upgrades) this does not mean that after a few years you can upgrade to the newer CPU's at a reasonable price as the motherboard purchased with the computer was designed for CPU's, RAM, Video Cards that were prevalent at the time the motherboard was made. They usually cannot take different class CPUs or newer faster CPUs or RAM that were developed afterwards. However the other components in the system are typically upgradeable. Although we use strictly industry standard components in assembling our computers to maintain independence of component providers, all of us are however dependant upon Microsoft for the operating system and upon Intel for the CPU's that fit in the motherboards we use. With all we do provide, it is possible some mistake our claims for providing the world; so we wish to mention several examples of items that are not included on delivery or under warranty. Peripherals like Printer, Scanners, Digital Cameras, etc., we prefer you buy elsewhere as there is no value we add to such items other than perhaps recommending a decent model. We are happy to help you research which model to buy and recommend you check with us before buying peripherals so we may help you avoid problems. We will set up most any peripherals you have or buy when we deliver your new computer, but we cannot offer any money back guarantee on such items. As a customer service; if you really want us to get such peripherals for you we will, but our forte is the sale and support of the computer we assembled not 3rd party peripherals for which we do not have parts. Warranty on such items must be handled through the manufacturer, as we do not have the parts nor schematics. Although we will set up such items at no additional charge assuming they are working properly we do not provide any warranty on them, however we will provide phone support / suggestions to fix problems with such devices regardless of where you bought them as long as it is being used on a DCI Computer. Excessive labor to setup a peripheral you supply is not included free with a system purchase. If an item you supply has problems or is incompatible with current computer hardware or the more current versions of Windows we will be happy to provide you help in remedying the situation, but not for free. There are many caveats one can get into promising to setup a customer's current peripherals on a new computer and the reason we need to know in advance just what items you already own and want reset up or moved. For example a scanner one already owns often will have come with an ISA type controller card and as new computers do not offer these types of legacy card slots there is no way we can get such a scanner to work on a new system. The scanner's bundled software may not be compatible with the newer version of windows that comes on a new system and so if updated drivers are not available on the scanner manufacturers web site than we cannot be expected to do the impossible. So while we will setup all your peripherals and software that is on the natural contingency that these items are in working condition and are compatible with a current computer system. Likewise when we offer to connect you new computer to your existing simple network this does not mean we are now responsible for supporting your network. We would need to know that you want it connected to your network in advance of delivery so we can find out what type of network it is and can verify that the network card we supply will be compatible with your cable. Should you need any cables run, a larger hub, or special network application configurations done we will be happy to oblige, but at our hourly rate and we probably would give you a discount on that rate with a system purchase. We bundle monitors with a system purchase at our cost as it would be unreasonable not to offer a monitor with a computer, however if you would prefer to get your own or a certain brand yourself we would encourage you to do so. Monitors we provide include a 2 year onsite warranty like the computer and if it needs service we will supply you with a loaner until we can return yours. Like the computer components we do not provide low-end monitors; since we will be responsible for maintaining it for 2 years it is not in our interest to provide a monitor we do not have faith in. However reliable name brand monitors are relatively inexpensive these days. Our main seller is a 17" and we have been happy with the Samsung, Hitachi and Viewsonic lines that typically sell for $220 with shipping. Your software setup is not under warranty. Should it get corrupted by; a virus, some software you installed or user error, then we are not obliged under warranty to fix it free of charge. Your software setup typically is by far the most time consuming part of a computer sale and setup. During the tutorial we go over ways you can protect it and when we quote a system we always push some type of backup device. If you took our advice and got a backup device, we provide you with routines to back up your data and your entire software setup; However it is your responsibility to make sure proper and rotational backups are done and to be able to restore such backups. Even if you do not get a backup device we offer to backup your software setup, as it was when we completed your initial setup. However while restoring such a backup is a great deal easier than redoing your setup from scratch; we do not restore it free of charge. To see how many people read this page we are offering you a special; just mention this code number 714 and we will deduct an additional $20 off a service call or $50 off a computer purchase, limit one per family or company. We will restore your original software setup one time at a reduced rate. Having us keep a backup of just your initial software setup is not as prudent as being able to do your own backups, since after a year or two should something go wrong with your software setup restoring a 2 year old version will typically not be sufficient. If as part of a system purchase we installed a scanner provided by you or us we will provide if asked (during delivery) some hands on instruction on using your scanner; however if a week later you are having difficulty learning to use it properly we are not responsible for additional training on such items. We will provide free advice by phone and if the scanner was purchased from us we do offer 1 follow-up free help session within the first 6 months and thus would provide additional help session on scanning at no charge. Scanning can be difficult to master and beginners typically scan at too high a resolution and do not keep an eye on the size of the files they are trying to work with. If we connected and tested a Palm Pilot, Zip drive or printer type device you provided and a week later it no longer works then we are responsible only if the port to which it is connected or a cable we provided has gone bad, we are not responsible for service time if the device went bad or some new item you added is interfering with it. When it comes to computers we do not claim to know it all. We know enough to know that any one who claims to know it all is full of you know what. We are not particularly good at Web Design as this takes more than just computer skills, but an artistic sense and more experience than we have in that field. We do not do Unix or mainframes. We do not deal with the Macintosh line, not because we are PC snobs; rather we just have no experience with them, nor the desire to gain experience in a computer system with such a closed architecture. For example you do not see many clones of Macs because the company that makes it keeps the rights all locked up thus creating a more limited 3rd party market and higher prices; Which may be good for that platform's users as it keeps it more controlled. We do some programming for our own purposes and as a hobby, but do not consider ourselves good programmers. Anyway there is a lot we do not know. However when it comes to assembling and supporting quality Industry Standard Computers, configuring reliable PC networks, configuring your Internet or shared Internet access, installing and helping with a wide range of various software titles and peripherals, repairing software setups, creating quality software setups, backing up software setups, and much more and with all due humility we do not believe you can find any better source. Still anyone can have an off day and we are not perfect, and can very infrequently get eluded by what in retrospect should have been a faster fix. If it ever seems like we are not totally familiar with something we are doing or suggesting, please keep in mind that although we have over 18 years of experience assembling and supporting many facets of PC compatible computers, many things change in the PC world on a daily basis. New and updated operating systems are introduced, updated versions of application software are always being developed, and new CPU’s, motherboards and peripherals are constantly being developed. With all our past experiences and the constant studying we do to so stay informed of updates and procedures we feel we have the expertise to adapt to these changes more quickly than our competitors. We only sell Intel Pentium brand CPUs. We realize that AMD has gotten many good reviews and are elated that there is competition in the market to force Intel to lower prices and provide more capable products; however we know of too many software titles that give no guarantee of compatibility with non-Intel CPUs and for the price our customers pay we can not take chances. Furthermore should you have a problem we suspect is related to the use of a compatible CPU, it is very difficult to verify such concerns since swapping such CPUs requires at least a different motherboard and reconfiguring Windows to the new motherboard. As for Intel's Celeron line of CPUs we do not find a saving of 4% on a DCI system purchase justifies the use of lower-end components or having to support too many varying configurations. At this time our computers come with your choice of Windows XP Home Edition (for Pro add $40), 98SE or Windows ME (Millennium). We do not bundle any free Internet Access with our computers, as we do not find the free services to be worthwhile. Some of our competitors bundle name brand services like AOL and MSN for 1 year; however we do not find these to be good providers, as we have had many customers whom were paying for these services change providers as their service had degraded considerable as did their support due to these providers having over loading what their infrastructure could properly handle. Again we find in this instance you get what you pay for. The Internet providers we currently recommend include Bellsouth, Earthlink, AT&T and perhaps Cox. We will gladly setup an account for you with any provider you desire or configure an account you may already have. We will also setup additional E-mail accounts if available through your provider and if you informed us in advance of delivery so we can be prepared. Although we have been assembling computers for over 18 years, which is longer than any company except IBM, Compaq and a tie with Dell, few have heard of DCI. As we only sell in the New Orleans area and do not sell in large volume we do not have the opportunity of being reviewed by publications like PC Magazine, etc. Computer reviews in such journals should be taken with a grain of salt, after all how bad are they going to come down on a company that spends literally millions of dollars each year in advertising with them. To play the large volume game requires a tremendous financial commitment, extreme business sense and the willingness to compromise when it comes to quality support. In the past we tried increasing volume by lowering prices, increasing advertising, hiring and trying to train technicians, at best we would get enough extra business to cover our added overhead. The technicians we tried to train often could not do as quality a job as we would like, and or end up going it alone and becoming a competitor. To compete on price in such an arena one needs to commit to huge volume purchases from their vendors; raise a huge amount of capitol, forgo any profits for the foreseeable future, have the ability to play your vendors against one another to obtain better prices than your competitors, be located where you can get low cost labor and centralized shipping. We prefer to supply the niche they leave vacant specifically higher quality computers and higher quality support, and only take on the jobs we can fully handle in-house. Lower volume and higher support naturally means higher base (not real cost of ownership) price and as people that buy from us expect complete support there is no point in quoting system without all the bells and whistles for it will just come back to haunt us should we cut any corners. Some potential customers get the impression that we build computer to their custom specifications and will use specific components based upon articles they have been researching. While we will try to provide requested items if need be in certain cases, but feel such practices would be doing you a disservice since assembling a system using components that we do not regularly stock nor will have ongoing experience with means we will not be able to provide quality fast service on such components. For example we are sometimes asked based upon some great review to provide a system with an Athalon CPU, in most cases the customer did not understand that this is an AMD (Intel compatible) CPU and not motherboard compatible with an Intel CPU. Not that there is anything wrong with an AMD CPU and thank goodness for AMD to keep Intel more competitive, but AMD CPUs are less supported and sometimes not supported at all by software vendors, and they require using a different motherboard as well; so if we were to order a singular board and CPU which we do not stock extras of, the n if there is any problem with that computer we would have a difficult time in providing the kind of quality support that our customers expect. Besides the few dollars it would save you to go with an off brand CPU does not justify the support headaches they might entail. Such offerings are best left to our competitor’s strategies of providing that initial attractive base priced system and good they do so AMD can stay in business and provided more competition and innovations. The components we use have great reviews (which you can access via the parts page) from many sources; plus we stock extras and are more familiar with them so can provide fast support. Besides such articles whether true or not are often written by companies that need to give a decent review so they can better insure the company they are reviewing will keep providing those all important advertising bucks, but ask the reviewer what CPU he uses on his mission critical system. Throughout these documents I frequently switch the person tense and use I instead of we or me instead of us a good bit. I do this because these documents were written by me (Dave Charbonnet) and as the author, a lot of what I am writing about pertains to my methods or approach and other times it is more of a full company approach or philosophy. Perhaps the best use of these files is to link them to a “help me sleep site” :). We apologize if this discussion/sales approach seem to have a rather harsh tone in that we point out our competitors weak points, but we know of no other way to relate the advantages we provide, having to be more informative and perhaps on the defensive. Our competitors do the pretty and pleasant ads, but we have not that option; as a quality computer with quality support costs more our customers need to be better informed in order to make a more educated purchase. A strange analogy might be “The devil’s approach is often more becoming than God’s (Not to compare ourselves to God in any way!). that is familiar with your whole setup and easy to reach! with limited availability on parts and service! Comprehensive, Quality and Reliable Software Setup! On-Site Delivery, Full Setup, Training and Fast Support! Beginners - We Have Patience! and comprehensive but organized software setup! Slogans in our case are commitments and mission statements; unlike such broad statements employed by our competitors such as “People Rule”, or “Be Direct” - leaving out the fact that their direct really is not so direct - being that they are out of state and you rarely if ever talk to the same person twice. These companies will stick you with a proprietary computer that no one can fully support as they have no interest in becoming familiar with your complete setup and thus incapable of providing you full support and limiting 3rd party service companies from being able to support their hardware due to its proprietary nature. Their real mission goals are volume sales obtained by an attractive base price, which necessitates the cutting of corners and support. A Link to a listing of some of our customers we would like to acknowledge our gratitude. to have artistic skills; however we are working on improving its appeal and our web artistry.